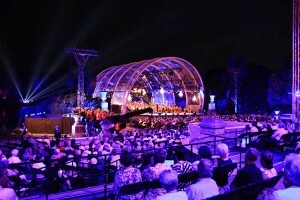 Germany – A special televised concert of La Bohème – a new production in the NDR Classic Open Air series – took place recently in Hannover’s Maschpark. 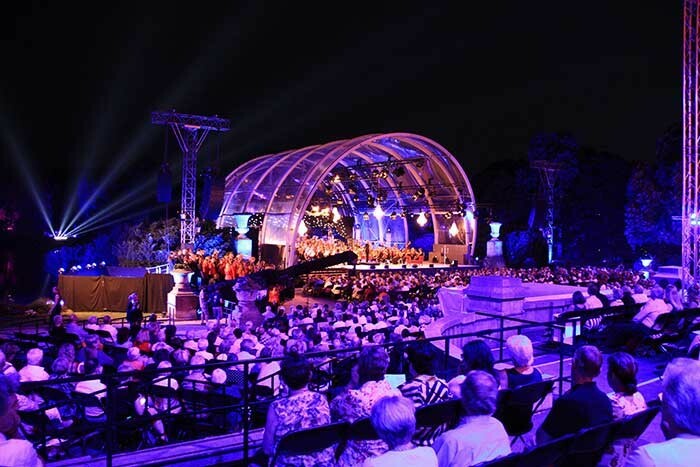 Puccini’s famous opera was not only heard live by an audience of 20,000 through Martin Audio’s award-winning MLA loudspeaker array system, but by television viewers tuning into NDR throughout the country and those picking up the live stream on NDR.de. The 2,000 ticketed concert goers in front of the stage were joined by crowds who gathered in the park, where they had an opportunity to witness the event (including rehearsal) for free. Responsible for the event’s sound system design was once again Georg Hentschel of Braunschweig based LiveAudio event technic GmbH. A specialist in classical shows, he had helped deliver the first classical open air concert (with MLA) in Hannover last year. The main PA rig comprised two hangs of six MLA each side of the stage, with a single MLD downfill at the base of each hang to draw the image down. These were aided by a pair of Martin Audio MLX subs, stacked at the base of the PA tower (while further subs were recessed under the stage). Six further W8LMD Minis, with vertically-arrayable wide dispersion characteristics, provided further nearfield coverage, actively driven by XTA and Crest. However, because this year additional seating was extended out wide, the system needed to provide extreme horizontal coverage of 135 degrees and thus two six-element hangs of MLA Compact were deployed as outfills. “This solution for extended horizontal coverage really worked, and the MLA and MLA Compact were in perfect harmony,” Georg Hentschel reports. Feeding the system from FOH were a DiGiCo SD7 digital mixer, partnered at the stage end by an SD10 monitor desk. But where Martin Audio’s magic (and Georg Hentschel’s genius in sound design) really shone through were away from the formal seating arrangement in front of the stage to the general public viewing the event on a big screen in the Maschpark. Here, having calculated difficult time alignment values, he divided the park into three zones serviced by various loudspeakers, including three hangs of eight MLA Mini enclosures, reinforced with two MSX subs, for Zone 1. Some of the challenges faced by Georg Hentschel could only have been surmounted by use of Martin Audio’s MLA. “One big problem of this site is firing the PA onto the wall of the government building; MLA provided us with a great solution to eliminate this, as we could kill the back-wall sound entirely. It was really amazing to operate this system in small saved steps, like a surgeon using his knife.” Hentschel also managed to isolate the orchestra through MLA’s tight multi-cellular control, ensuring that no back-sound disturbed the stage area. In view of the high volume level produced by the orchestra, and his need to mitigate the direct sound, Georg Hentschel also decided to drop the flown MLA system almost to the mid point of the stage – 7.5 meters from top box to the ground – in order to generate a more controlled mix. “This was because the round shaping of the stage worked like a big horn,” he explained. “By dropping the rig I was able to bring in the sound system very smoothly and at the same height as the virtual orchestra sound. The result was an overwhelming success. “We were not only delighted with how well this worked [for the paying concert-goers] but also for the huge amount of praise we received for the performance of MLA Mini in the park. In particular this was from the Government who invited the townsmen of Hannover. “As for the main stage one of the singers told us that it was the best open air live sound he had ever heard." 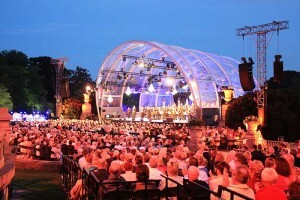 The concert saw Kery-Lynn Wilson conducting the NDR Radio Philharmonie, with choirs consisting of the Johannes-Brahms-Chor Hannover and Mädchenchor Hannover, Thus the tragic opera reached its inevitable conclusion in a way that no-one who attended will forget as Rodolfo (featuring Michael Fabiano’s tenor) lamented the death of Mimi (fellow soloist, soprano Carmen Giannattasio).